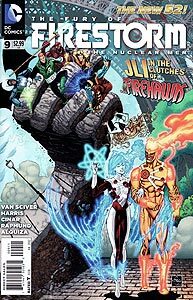 Cover Description: The Justice League International is caught in a giant hand controlled by Firehawk. Brief Synopsis: The JLI heads to Paris to save the Eiffel Tower from rogue Firestorms. Issue Summary: American Firestorm Jason Rusch feels in over his head as he works with France's Firehawk and Britain's Hurricane to save the Eiffel Tower from destruction by a rogue Firestorm. Matters are made worse when the JLI (August General in Iron, Batman, Batwing, Booster Gold, Godica, Guy Gardner, and OMAC) arrive and mistake him for the enemy. This brief misunderstanding allows the rogue Firestorm to launch a suicide on Paris. Firestorm delays the terrorist long enough for OMAC to stop him with physical force. Guy Gardner contains the explosion released by the dead rogue Firestorm. In a bid to increase his power, Firestorm merges with Firehawk to unleash the gestalt entity Wrath. Wrath appears to be an even match for OMAC, but an unexpected mental connection between Jason Rusch and Ronnie Raymond, who is lost somewhere in the Middle East with the Russian Firestorm, Pohzar, causes Wrath to explode. Issue Notes: The story of this issue is continued in Justice League International #10. The Justice League International (August General in Iron, Batman, Batwing, Booster Gold, Godiva, Guy Gardner, and OMAC), having just arrived at the Eiffel Tower, mistake a Jason Rush for the rogue Firestorm that just attacked them. This case of mistaken identity leads to an immediate fight between heroes. Fortunately for all, Skeets is able to provide background details about the French Firestorm, Firehawk, and the British Firestorm, Hurricane. As soon as Firehawk speaks to Booster Gold, he invites her to join his team. This may be a new Firehawk, but it's the same old Booster Gold. Guy Gardner calls the Firestorms "Fatboys and Little Men" in a derogatory pun on the codenames of the atomic bombs dropped by America on Japan to end the Second World War. The bomb "Little Boy" was dropped on Hiroshima on August 6, 1945, and the bomb "Fat Man" was detonated over Nagasaki three days later on August 9, 1945. The rogue Firestorm appears to be targeting the Ecole Militaire at the opposite end of the Champ de Mars from the Eiffel Tower. The Ecole Militaire is a military school and campus. In order to stop the rogue Firestorm, OMAC rips his head off, releasing his atomic energy. This appears to have no negative effect on OMAC. Booster Gold watches as Jason Rusch surprises Firehawk with a kiss, triggering the transformation of the pair into Wrath. With no rogue Firestorms to fight, Wrath immediately attacks OMAC with no apparent motivation. As quickly as it appeared, Wrath disappears, taking Firestorm and Firehawk with it. Skeets' immediately announces that "another incident" has happened in New York. Is this remarkable timing more than a coincidence? As the JLI prepare to head back to the United States, Batman and Booster Gold decide to petition the French government for access to Firehawk. They don't seem very bothered by the fact that they no longer actually have the endorsement of the United Nations. Boosterrific Review: I suspect that even if I had read every issue of The Fury of Firestorm: The Nuclear Men up to this point, I would still be as confused as the characters appear to be in this book. With the exception of the clear and present danger of a terrorist bomber in Paris, everything else seems to be a series of misunderstandings and unexplained happenings. Too bad that nothing herein makes me especially want to get to the bottom of any of these mysteries.